Our Chicago corporate attorneys frequently develop, draft, review and negotiate commercial lease agreements for our business clients. More often than not, commercial lease agreements, on the tenant side, are the largest liability of the business. For example, it is common practice for lease for office space have a term for five years (often with options to renew). Let’s say that said lease has a base rent of $2,000 a month, not including additional rent, CAM charges, HVAC maintenance, utilities, broker fees, and general liability insurance costs). When the tenant executes this commercial lease, the tenant has incurred a $120,000 liability ($2,000 x 12 = $24,000 a year x 5 years = $120,000). This is a very significant liability for any new business, which generally the landlord will require the business owners to provide a personal guaranty. Therefore, by engaging a one of our corporate attorneys for a few hours to review, negotiate a commercial lease agreement, could save you and your business a lot of money and unnecessary headaches should a problem arise during the term of the lease. Landlord would likely want to ensure that the lease agreement lists the proper responsible party to the lease. This may be a business entity, an individual, or both. The party description may become important if the event the landlord must enforce particular provisions of the lease agreement to collect rent, enforce tenant’s obligations, or to evict tenant. Tenant would likely want to ensure that the lease agreement lists the proper legal entity as the landlord. Additionally, if the tenant is a business owner, he or she would likely want to list the proper legal entity as the responsible party to the lease, rather than giving a personal guarantee. Landlord would likely want the commercial space to be used exclusively for a specific purpose, such as for an office. Thus, even if zoning laws may permit other uses, the landlord would want to incorporate into the lease agreement that the commercial space only be used for the landlord’s intended particular purpose, and not to be used for some other purpose. Tenant would likely want the broadest possible use of the commercial space not only for Tenant’s own business operations, but also in the event Tenant assigns the lease or sublets the commercial space to a third party. Thus, the tenant would want to negotiate the “Use of Premises” provision broadly. Our Chicago corporate attorneys frequently develop, draft, review and negotiate commercial lease agreements for our business clients. 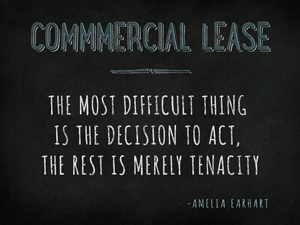 More often than not, commercial lease agreements, on the tenant side, are the largest liability of the business. Therefore, by engaging a one of our corporate attorneys for a few hours to review, negotiate a commercial lease agreement, could save you and your business a lot of money and unnecessary headaches should a problem arise during the term of the lease. Landlord would likely want to specify a limited term to tenant’s occupancy of the commercial space. Generally, this provision would identify the date from which the rent would commence, and calculate the duration accordingly. For budgeting purposes, the tenant would likely want to identify the date on which the tenant lease payments under the lease agreement will commence. Additionally, this provision my protect tenant against not having a interest in the commercial space for the desired period of time, and eliminates any doubts as to the specific duration of tenancy. Generally, this provision would likely protect the landlord from having to absorb the costs of real estate taxes and/or the maintenance and operation of the commercial space. These costs could presumably be passed to the tenant on a prorated basis. The provision may also protect the tenant from having to pay more than its fair share of the real estate taxes and maintenance and operation expenses for the commercial space during the term of the lease agreement. The provision may allow the tenant to audit landlord’s statement of expenses and to obtain credit for any overpayment. Additionally, the provision may allow the tenant to object to certain maintenance and operation expenses for the commercial space incurred by the landlord.